Following the devastating typhoon which struck the Philippines on Friday, many of the island’s Filipino community remain anxious, with the storm having damaged communication lines leaving many Bermuda residents unable to make contact with their family. As many as 10,000 people are feared dead, and tragic tales continue to emerge, with reports of children being swept from their parents arms, the airport housing a makeshift morgue and people scouring piles of garbage in the streets for food and water. The U.S. military will be lending support, with Marines based in Okinawa, Japan set to commence search-and-rescue missions, bring in aid and provide logistical support. They plan to fly in requested aid by transport aircraft and heavy-lift helicopters into the most damaged areas. One local Filipino woman is hoping to make contact with her daughter, who was in one the hardest hit areas, while another gentleman has not heard from his family at all, and said his instinct is to try and get home to the Philippines to make sure his family is okay and to help rebuild his family’s house if needed. The Association of Filipinos originally planned an event for the victims of the recent earthquake in the Philippines this coming Monday [Nov 11] at St. Theresa’s Church Hall at noon. However, in the wake of Typhoon Haiyan, they are now extending that fundraising event for the relief operations for the typhoon victims. The fundraising event is a Charity Lunch and Bingo. Tickets cost $25.00 + 2 Bingo cards if you wish to play. 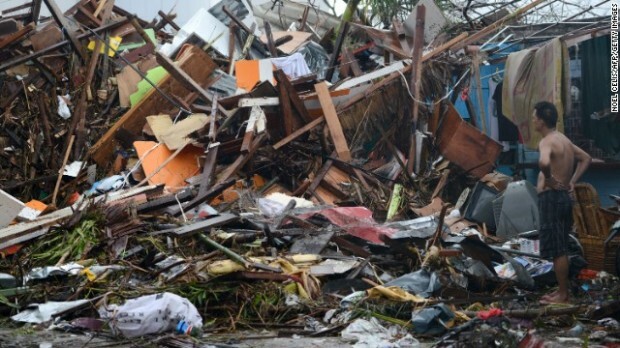 Should anyone wish to donate [the Association is a registered charity, #529], they can send their donations to: Association of Filipinos in Bermuda, Bank of NT Butterfield, Current Account no. 2000 6060 258 204 100. The storm’s sustained winds reached 195 miles per hour [313 kph] with gusts of up to 235 mph [378 kph]. To give a comparison, Hurricane Fabian, which left a path of damage across Bermuda and four people dead in 2003, had winds at around 120 mph, with some gusts reported over 160 mph. Super Typhoon Haiyan is reported to be one of the most powerful storms to ever make landfall. Such a sad tragedy. I hope their families are ok and my condolences to any who have lost loved ones. Can’t imagine. I hope the whole community will generously support our Filipino friends and neighbours with donations through their Association and other organisations. Such a horrible, terrifying disaster! Will there be a relief fund set up to help the country? I’d like to donate. Thanks! Just after 1.00PM HE The Governor arrived at St Theresa’s church hall for lunch in support of the fund raising efforts..